As news on the extent of Friday night’s Humboldt Broncos crash spread, the question remains about the cause of the collision that killed 15 people associated with the small-town hockey team, and injured several others. RCMP have released few details, saying that traffic analysts continue to investigate potential causes, including road, weather, mechanical and driver conditions. As news of the extent of Friday night's Humboldt Broncos bus crash spreads, questions remain about the cause of the collision that killed 15 people associated with the small-town hockey team, and injured several others. RCMP have released few details, saying traffic analysts continue to investigate potential causes, including road, weather, mechanical and driver conditions. "This is a very involved investigation and, due to the large amount of evidence, information, and the number of victims, this work will take some time," RCMP Saskatchewan Assistant Commissioner Curtis Zablocki told reporters on Saturday afternoon. 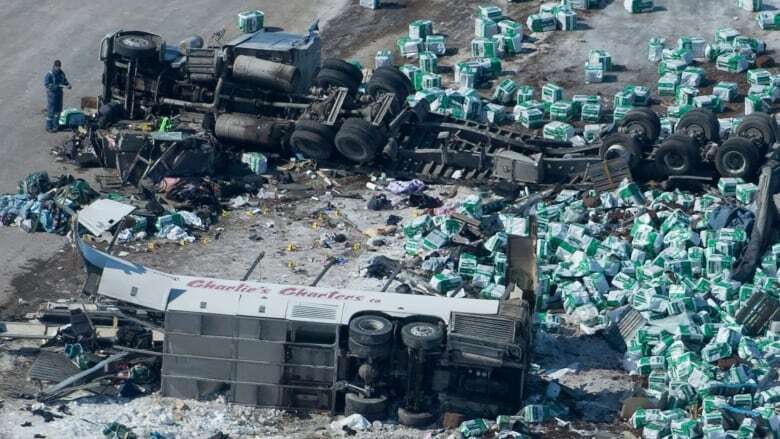 The driver and sole occupant of a semi-trailer was heading west on Highway 335, while the Humboldt Broncos team bus carrying 29 people was northbound on Highway 35. The team was headed to Nipawin for Game 5 of its semifinal series against the Nipawin Hawks. The semi-trailer would have had to stop at a stop sign before crossing over the highway that the hockey bus was travelling on. Instead, around 5 p.m., the vehicles collided. Footage taken after the crash showed the bus on its side, its roof peeled back and its front end destroyed. There is a stand of trees on the southeast corner of the intersection, limiting visibility of the approach on both roads. Zablocki said the driver of the tractor trailer was not injured and was detained initially as part of the police investigation of the collision. He was released, and is currently receiving "mental health and wellness assistance," according to Zablocki. RCMP had put the death toll at 14 people as of last night, but on Saturday, confirmed that one more of the people aboard the Broncos' bus had died. 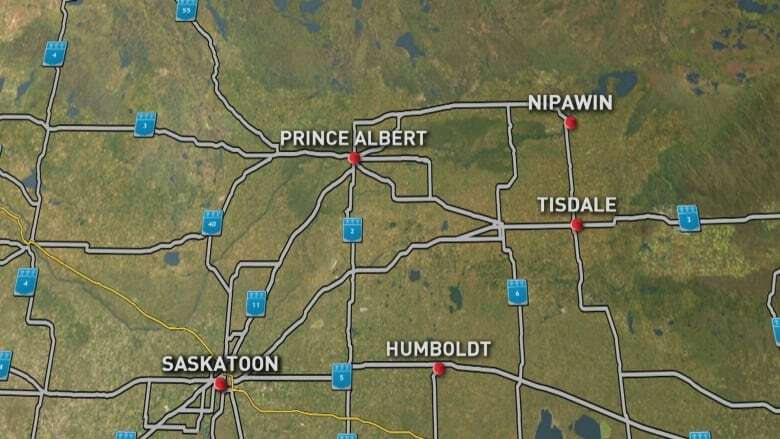 Others remain seriously injured, following the crash that took place about 30 kilometres north of Tisdale, Sask. A row of white crosses can be seen near the crash site of the intersection. Those who sit on the Rural Municipality of Connaught recalled that about 20 years ago, there was a collision at the same intersection involving a family of six, who failed to stop at the stop sign, and collided with a grain truck, leading to their deaths. Reeve Art Lalonde said since that accident, flashing lights have been added to the stop sign, but he and Coun. Brad Schiltroth, who represents the area, said they both believe there's more that could be done. "People drive through that intersection all the time and there's no reason for it. There's flashing lights, there's two big stop signs," said Schiltroth, noting that little traffic averted most accidents — until now. Friday night's collision and death toll had both discussing the need to look at more safety measures, such as introducing rumble strips on the highway. "This is a real horrific thing we're not used to seeing," said Lalonde of the crash. "Something else has got to be done."